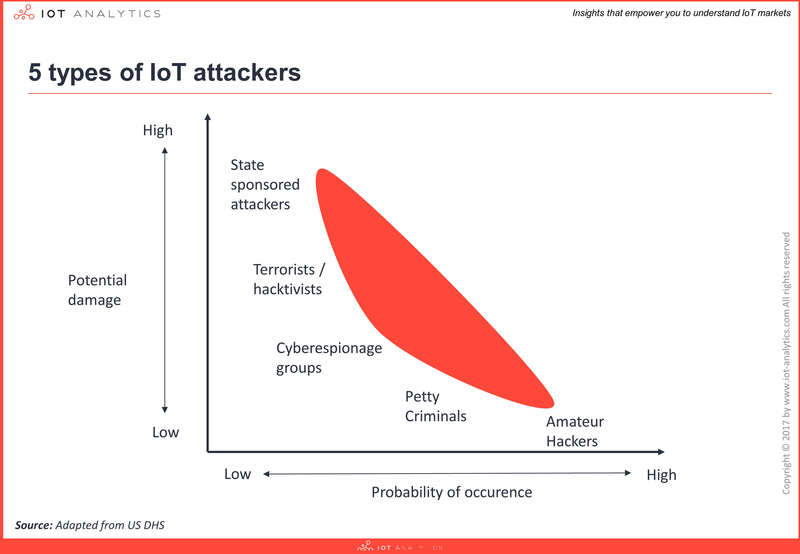 This compilation of IoT security insights considers current trends, attack vectors, and outlines the gaps in the current ecosystem. We are currently witnessing a growing number of IoT deployments and solutions around the world. 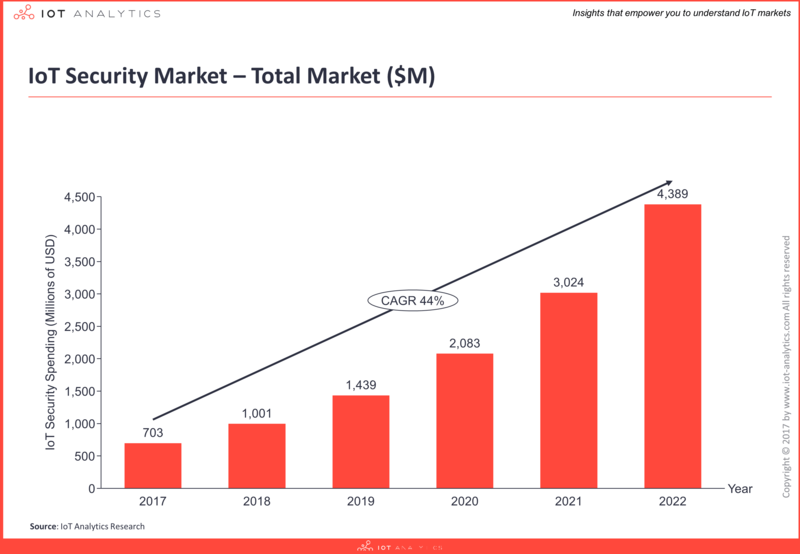 IoT security is emerging as a key component of these deployments and companies are recognizing they need to get it right from the beginning – By 2022, the IoT security market is forecast to reach $4.4 billion. Various industry surveys, as well as our own research, indicate cybersecurity is the #1 concern for industrial IoT users today. IoT Security is key for the secure development and secure operation of scalable IoT applications and services that connect the real and virtual worlds between objects, systems, and people. However, as our recent 3-part introductory series on Understanding IoT Security shows, IoT security is complex and the market landscape is largely fragmented with a host of vendors competing to address the opportunity. Global spending for end-users of 3rd party security solutions is currently estimated at $703M for 2017 and is forecast to grow at a CAGR of 44% to become a $4.4B market by 2022, driven by new regulation and increasing IoT adoption. More points of exposure: The growing number of connected devices, applications, systems and end users mean more points of exposure. IoT devices themselves become new attack vectors: Every compromised device becomes a new possible attack point, which by definition means a higher probability of attacks. Increased impact of attacks: With more connected devices in many applications (i.e., hundreds of different use cases which all build on different standards, interact with different systems and have different goals – for example, see the Enterprise IoT Project List for 640+ different use cases), especially critical infrastructure applications where there is an increased impact of attacks (i.e., damage to the physical world and possible loss-of-life), the stakes are much higher for hackers which increases the threat level. New threats from across the stack: In addition, a more complex technology stack means new threats are possible from across the stack (i.e., from the different hardware, communication, and software elements – see Insight 2) which must be counteracted by the implemented cybersecurity measures and by experienced security professionals. Example: A large industrial components manufacturer we recently talked to is now connecting legacy equipment on the shop floor to the internet to enable condition monitoring and predictive maintenance solutions. They concluded that by connecting the operational technology (OT) system and the information technology (IT) system – which were previously operating on two separate Wi-Fi networks within the same building – it creates new points of exposure that can be attacked. In particular, they noted that compromised 3rd party applications (i.e., from maintenance/service providers) could act as an entry point to the network and be taken advantage of to access other connected systems and bring production to a standstill. Communication: The communication layer refers to the connectivity networks of the IoT solution i.e., mediums over which the data is securely transmitted/received. Whether sensitive data is in transit over the physical layer (e.g., WiFi, 802.15.4 or Ethernet), networking layer (e.g, IPv6, Modbus or OPC-UA), or application layer (e.g., MQTT, CoAP or web-sockets) unsecured communication channels can be susceptible to intrusions such as man-in-the-middle attacks. Security components include: access control, firewall, IPS, IDS, and end-to-end encryption. Cloud: The cloud layer refers to the software backend of the IoT solution i.e., where data from devices is ingested, analyzed and interpreted at scale to generate insights and perform actions. IoT cloud providers are expected to deliver secure and efficient cloud services by default to protect from major data breaches or solution downtime issues. Security components include: data at rest, platform and application integrity verification. 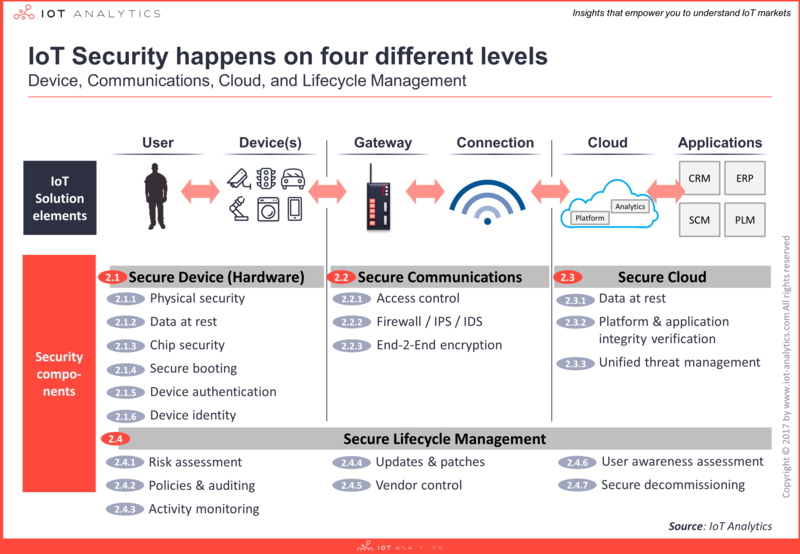 Lifecycle management: Secure Lifecycle Management refers to an overarching layer with continuous processes required to keep the security of an IoT solution up-to-date i.e., ensuring sufficient security levels are in place from device manufacture, initial installation to the disposal of things. Security components include: risk assessment, policies & auditing, activity monitoring, updates and patches, vendor control, user awareness assessment, and secure decommissioning. For example, next-generation activity monitoring enables advanced anomaly detection, building on sophisticated machine learning algorithms. One case includes objectively classifying ‘good’ files from ‘bad’ files based on mathematical risk factors, which means it becomes possible to teach a machine to make the appropriate decisions on these files in real time. This method drives autonomous decision making and changes the way an IoT device understands, categorizes, and controls the execution of every file. Example: Armada Collective is an example of a traditional cyberespionage group that has recently demanded that businesses pay thousands of dollars (predominantly in Bitcoins or via PayPal) or run the risk of having their services brought down by crippling cyber-attacks. Although the actual members of the original Armada Collective appear to be locked up in a European jail, some enterprising individuals that are financially motivated are continuing to use the group’s name for extortion. Published at DZone with permission of Padraig Scully , DZone MVB. See the original article here.